Could Total Extraperitoneal Hernia Repair Done Under Spinal Anesthesia Without Fixation of Mesh Be Recommended As the First Line Procedure for Unilateral Inguinal Hernias? 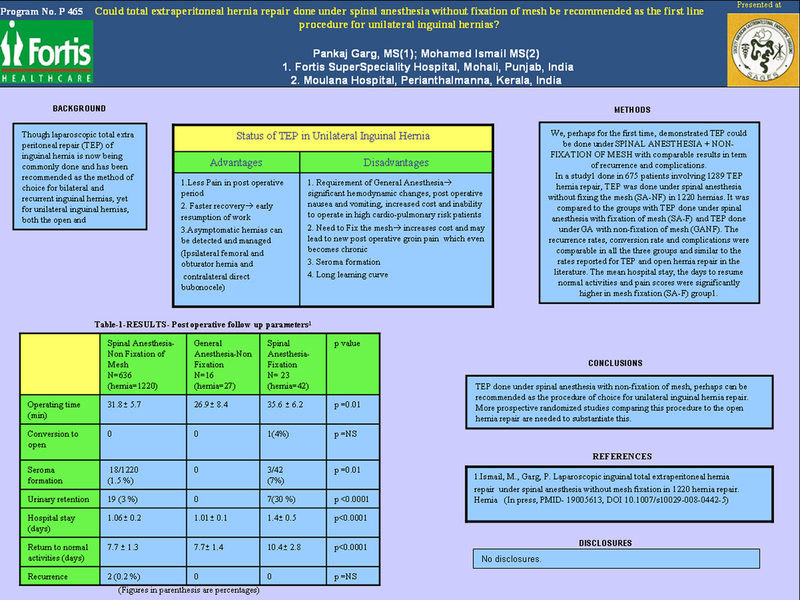 Background-Though laparoscopic total extra peritoneal repair (TEP) of inguinal hernia has been recommended as the method of choice for bilateral and recurrent inguinal hernias, yet for unilateral inguinal hernias, both the open and TEP are considered at par. While doing unilateral inguinal hernia repair, TEP has several advantages over the open repair. The pain in the early post operative period is less, the patient recovery is faster leading to early resumption of work, the symptomatic ipsilateral femoral and obturator hernia and contralateral direct bubunocele can be detected and managed at the same time. However, it is associated with distinct disadvantages. These are requirement of general anesthesia(GA), need to fix the mesh, seroma formation, high cost and difficult learning curve. GA, when compared to spinal anesthesia (SA), can lead to significant hemodynamic changes, post operative nausea and vomiting, increased cost and inability to operate in high cardio-pulmonary risk patients. Fixation of mesh with metal staples also increases cost and may lead to new post operative groin pain which even becomes chronic in small percentage of patients. So need for GA and mesh fixation are considered as the major disadvantages of laparoscopic hernia repair. Several studies have compared TEP done under GA to SA and with fixation of mesh to non-fixation of mesh. The results showed that TEP could be successfully done under SA or without fixation of mesh with no increase in recurrence rate or any other complication. Methods – We, perhaps for the first time, demonstrated that TEP could be done under SA without fixation of mesh with comparable results in term of recurrence and complications. In a study(1) done in 675 patients involving 1289 TEP hernia repair, TEP was done under SA without fixing the mesh (SA-NF) in 1220 hernias. It was compared to the groups with TEP done under SA with fixation of mesh (SA-F) and TEP done under GA with non-fixation of mesh (GANF). (Table-1) The recurrence rates, conversion rate and complications were comparable in all the three groups and similar to the rates reported for TEP and open hernia repair in the literature. The mean hospital stay, the days to resume normal activities and pain scores were significantly higher in mesh fixation (SA-F) group(1). Discussion- The procedure-TEP done under SA with non-fixation of the mesh- had all the advantages of TEP without its major disadvantages viz GA administration and need to fix the mesh. TEP under SA is a bit technically demanding. However several studies have shown that doing TEP under SA or epidural anesthesia is feasible, safe and had complications rate similar to cases done under GA. Since preperitoneal space collapses after the TEP procedure is completed, the mesh is ‘sandwiched and stabilized’ in the preperitoneal space even when the mesh is not fixed with any method. Several studies in the past have confirmed the safety, low recurrence rates and better results in terms of pain of the TEP procedure done with non-fixation of mesh. Conclusions- TEP done under SA with non-fixation of mesh, perhaps can be recommended as the procedure of choice for unilateral inguinal hernia repair. More prospective randomized studies comparing this procedure to the open hernia repair are needed to substantiate this.